Always knowing when to expect your next period will give you peace of mind and spare you from any unnecessary inconveniences and mishaps. Intimately knowing your entire monthly cycle though, will not only give you practical knowledge such as your fertile days and when to expect menstruation, but will also give you complete understanding and respect for the phases that your mind and body naturally go through each month. Traditionally however, complicated methods and differing opinions on the matter have made this seem not worth the bother, to the point that until today, most of us simply don’t. Memorizing formulas and crunching the numbers, alongside seemingly expert advice contradicting each other every few months, have made most of us too confused to make any use of this information that is so vital to the modern woman. Well then, it follows that the modern woman should make use of modern means to suit her lifestyle. 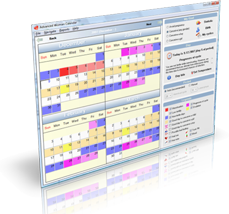 Which brings us to the Advanced Woman Calendar software from www.eovulation.com. 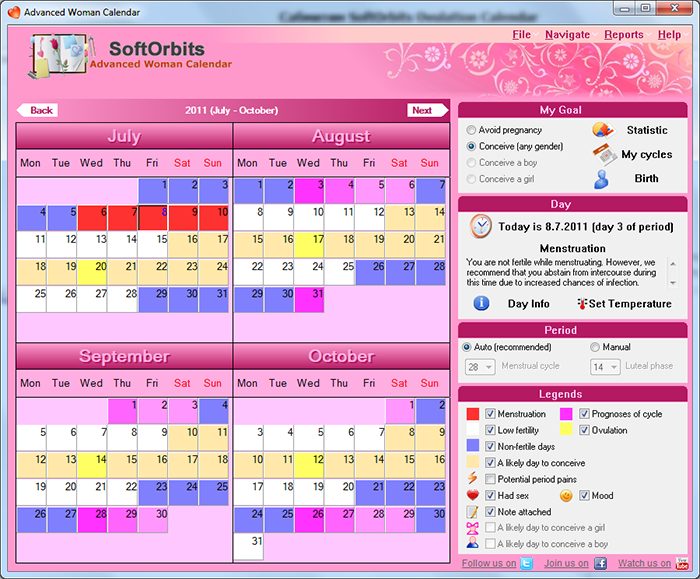 Arguably still the most preferred menstruation and ovulation calculator, this program was authored by award-winning software group SoftOrbits, a recognized member of the Independent Software Developers Forum (ISDEF) and the Organization of Independent Software Vendors (OISV). More importantly, this software is easy to use, very informative, and packed with features you never knew you wanted, but could never live without once you get to use them. Its main feature is of course its menstruation period calculator. Because it takes into account your past three periods, it is able to accurately predict your next one regardless of your cycle length and regularity. But more than being a menstruation calculator, it also tells you your most fertile days as well as your safe days in varying degrees, tracks premenstrual syndrome and basal body temperature, and even shows the best days to try for a boy or for a girl. Topped off with a free online version and a 30-day no questions money back guarantee, this may, after all, compete with the best in being the proverbial God’s gift to women.